I think most of these toys are ones that have been highly recommended to me through my sisters and between all of us girls we've had 14.5 kids. (Yes, I have the .5 currently.) My sisters are very experienced. And, they are the toys that I keep in our Sunday bag each week because they actually work. 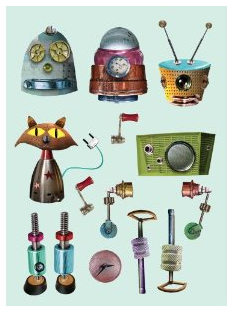 However, to preserve the magical power of these toys, I recommend only letting your kids play with them when you need them to. That way they are still fun. Alright, here we go. 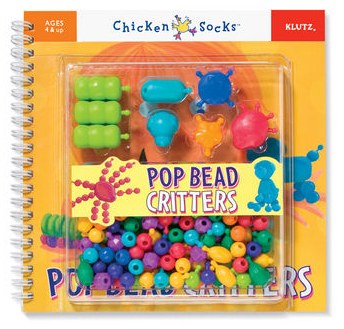 1) Klutz Pop Bead Critters. These are pop beads, but they aren't marketed like jewelry. You make little critters out of them. They come with a book attached, but we've ditched the book and brought the beads in a zip lock. Every kid loves these. If I see a some kids having a hard time at church I pass this bag. It's a great secret weapon. Baden (3) is easily old enough to use them and even older kids think they are fun. I also test the toys myself as well. Really. If I even like playing with them, it's a win. They always seem to be out of stock on the Klutz web site, but I purchased them through Wal-mart and did the free site to store shipping. 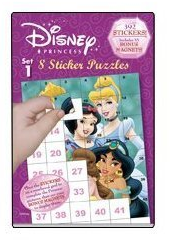 2) Sticker Puzzles. I've only seen these at a great local toy store we have here, but you can find them on Amazon HERE in all sorts of themes. These are really fun too. We have purchased all the super hero ones a couple of times in the past few years. 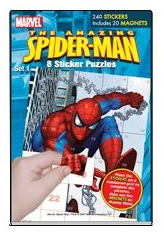 There are 8 puzzles per book. There's a sheet of rectangular stickers, each with a small number on them and then another sheet that has a grid on it. You place the stickers in the right number spot and then it becomes a picture. These are great for kids 4 and up I would say. Rex (5) can do them independently, and Baden (3) likes them, but he needs a little help and gets frustrated without it. 3) Our quiet book. This was a guest post on my blog by iCandy which you can find HERE and then I posted about mine and some places to find pages HERE. The beauty of these quiet books is that you can easily change out the pages. Since making our book, I've found washable dry erase markers by Crayola and I highly recommend them if you make this. The dry erase crayons get all over clothes (though they do wash out) and regular dry erase markers don't wash out. 4) Magnetic toys. We have a construction and superhero version of this toy, but my friend had this robot version that's way cooler. It let's you use the different parts to build your own robot. It provides the background scenes which are paper and then the case itself is metal, so you can use it to build on. There are lots of different version you can buy. If you have girls, there are great dress up ones as well. I've purchased mine at that local toy store, but you can find this one on Amazon right HERE. 5) The fifth toy I will admit that I haven't purchased, but it's next in line and the reviews on it are great. They are called Wikki Stix. 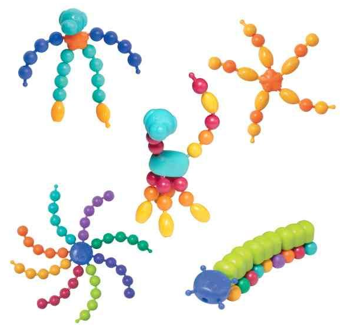 They are waxy, bendable sticks and they can be used to make fun shapes or even sculptures. This activity set comes with a board to work on, but you can also buy alphabet cards separately and the kids can practice shaping the letters with them. You can find them HERE on Amazon. The alphabet cards are HERE. So, what about you? 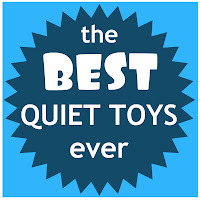 Do you have a secret weapon quiet toy that's a hit? I'd love to hear about it (and I'm sure the rest of the readers would, too.) Thanks for stopping by. I hate those wiki sticks. they make little fingers coated with that waxy stuff, and it gets on white sunday buttonups, too. i'd say my kiddos used them about 3 or 4 times before they lost their appeal. What great ideas!!! 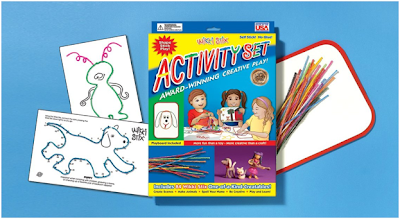 I'm checking out all your links right now for my niece's 3rd birthday coming up at the end of the month :) WIkki stix are awesome. We primary teachers use them a lot in school to "circle" or underline words in books. I just snip them to the right length and the kids think they're way fun to use too! 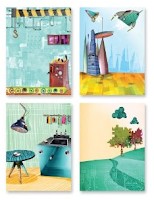 Awesome list - I just added tons of stuff to my amazon cart. Will be adding some new things to my purse and the road trip box. I had wikki stix as a child, but have never seen the alphabet ones, awesome! That is a great list! As kids, we would play with felt shapes (triangles, squares, rectangles, circles, etc.) at church. They stick to the fabric on the pews at church. We could make anything we wanted and it kept us [mostly] quiet! Such great ideas! 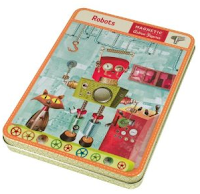 I'm bookmarking most of them especially the magnetic robot! I will say my oldest (5) was given the Wiki sticks and I was unimpressed. He was super frustrated by them and the wax/sticky mess was just not worth the project. We threw them away fast. Maybe if you keep hand wipes on standby you'd be okay. There's a local restaurant we go to occasionally, that gives out wiki sticks instead of crayons and a coloring page. My son loves them. I've never bought it before, but I know they carry it at AC Moore. I don't have to worry about keeping my son quiet during church because while I'm in service my son goes to Sunday School, where he learns all about religion and is kept busy and babysat (He's 5, but this goes all the way up to 8th grade). A quiet activity that my son loves, but is not transportable is Perler Beads. Definitely needs to be kept at a table, but he'll sit quiet and make things for at least an hour by himself. They make large perler beads for smaller kids and the normal size for older kids (which he is just starting to use). You can use the provided designs, or my son's favorite... just uses the plastic grids to make his own designs (usually guns of various sorts). Although I just looked on the Perler Bead website and they now have a bead 'n carry kit, but I've never used it so can't vouch for it's portability. I just bought a set called Melty Beads (very similar to perler) at Walmart for my six year-old who is off-track. He's bored when he's brother (5) goes to preschool, which is on traditional schedule (don't get me started on the different schedule thing. I can go on for days about it). Anyway, both boys love them. Definitely a home project, but worth it. I also saw a farm theme one on Amazon. Thanks hon, I have wicki sticks and love them. I am going to get the pop bead critters, we have jewelry ones but I want the boy version for my guy! I would recommend to you finger puppets. We got a ton from a rummage and they are great at restaurants. Really entertaining. My friend recommended that putty in a red egg, what is it!? Anyway, we are not "There" yet but I remember it from my childhood!! Right now we take those small play-doh tubs and the puppets with us and have been good to go! My final secret weapon is Levi's electronic Cars game. It has a "Silent" button, making it really engaging and totally quiet...though I don't *love* kids getting hooked on electronics!! I hate Wiki sticks too. My kids got into them once during naptime, when they were supposed to be napping, and there are now several stuck in our carpet that will not come out. These are AWESOME ideas Cheri! I love this post. I am pinning this for sure. Thank you for the tip on dry erase crayons. I wondered about those. Good to know. Those pop beads sound perfect too! We use Wiki Sticks a lot in the classroom when I was teaching. They are great for making letters or working with maps in geography (tracing routes, etc) I don't think I would recommend them for kids under 6, though. Great ideas! Found the pop beads at Target online. If you have the Target Red Card (which is awesome, so you should), you can get free shipping. My nephew just turned 3, these would have been great ideas for birthday gifts. My sister can not seem to keep him quiet (which I find hilarious). But since I am Super Aunt (hear me ROAR!) I can buy him gifts anytime and if not, I can get prepared for bday 4. I think he would love the sticker puzzles and a quiet binder both. 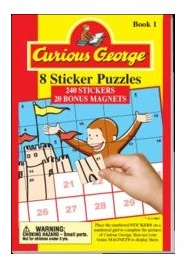 love those stickers book puzzles. the dollar store in our area also has sticker books that have a shadow and you have to match the sticker to it's shadow. my three year old can handle them on his own and loves them! Another person that hates wikki sticks sorry BUT my kids sit still all through church IF they get to play with a wooly willy. It's pretty vintage but I found them at Michaels in their $ spot.